Shown are Connie Bailey, Katie Cox, Marilyn Rollwage, Katie Hilderbrandt, Patti Hedrick, Christina Biederman and Jen Garrison; the puppy is Zoey and the kitty is Willow. 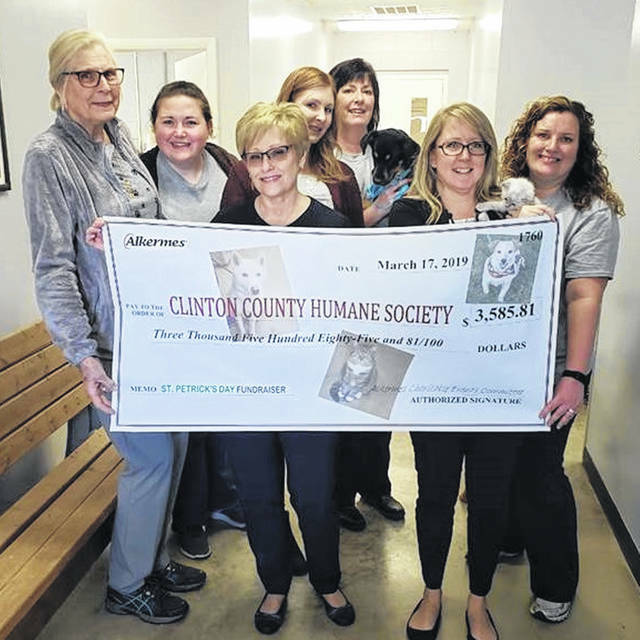 WILMINGTON — The Clinton County Humane Society is a non-profit organization dedicated to protecting and saving the lives of homeless, abused and neglected animals in Clinton County. In March, Alkermes held several employee-led fundraisers as part of their annual St. Patrick’s Day festivities and raised $3,585.81. Alkermes also has around 20 employees who donate their personal time on a regular basis. All of the Clinton County Humane Society’s animals are vet-checked and altered before their adoption to ensure they are healthy when they find their loving family and home. They rely on volunteers for their time, talents and compassion to accomplish the goal of finding loving homes for the kittens, cats, puppies and dogs in their care. Fun Fact: To date, the Clinton County Humane Society has aided in the adoption of 6,199 dogs, 1,634 cats, one rabbit, four guinea pigs, two chinchillas, nine cockatiels, one dove, three lovebirds, one chicken, one turkey, one ball python and two boa constrictors!